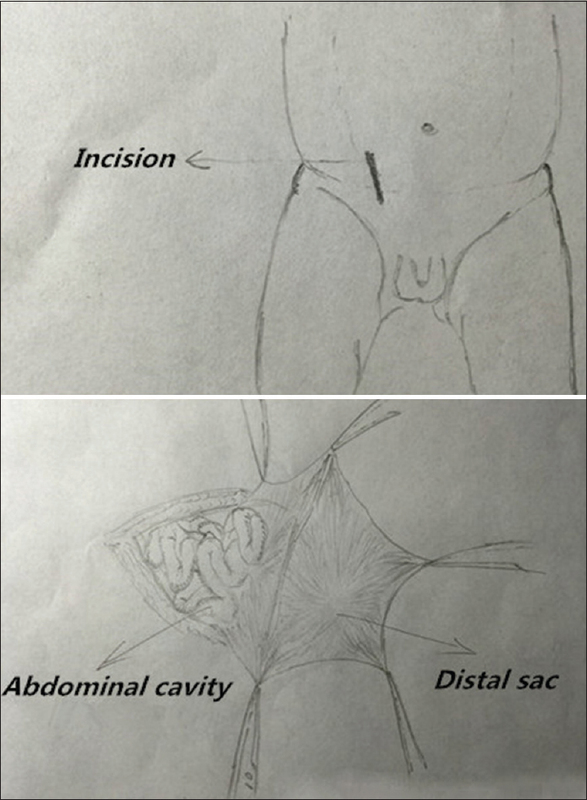 Background: This study aims to evaluate the utility of the “Cross-Internal Ring” inguinal oblique incision for the surgical treatment of incarcerated indirect hernia (IIH) complicated with severe abdominal distension. Materials and Methods: Patients of IIH complicated with severe abdominal distension were reviewed retrospectively. All patients received operation through the “Cross-Internal Ring” inguinal oblique incision. Results: There were totally 13 patients were included, male to female ratio was 9-4. The time for patients to resume oral feeding varying from 2 to 5 days after operation, no complications include delayed intestinal perforation, intra-abdominal abscess, and incision infection happened. Average postoperative hospital stay was 5.2 days. All cases were followed up for 6–18 months. No recurrence or iatrogenic cryptorchidism happened. Conclusion: “Cross-Internal Ring” inguinal oblique incision is a simple, safe, and reliable surgical method to treat pediatric IIH complicated with severe abdominal distension. Background: Mutations in the acid alpha-glucosidase (GAA) gene usually lead to reduced GAA activity. In this study, we analyzed the mutations of GAA and GAA enzyme activity from one sibling suspected Pompe disease and their first-degree relatives. Materials and Methods: In this cross-sectional study, GAA enzyme activity assay was assessed using tandem mass spectrometry. 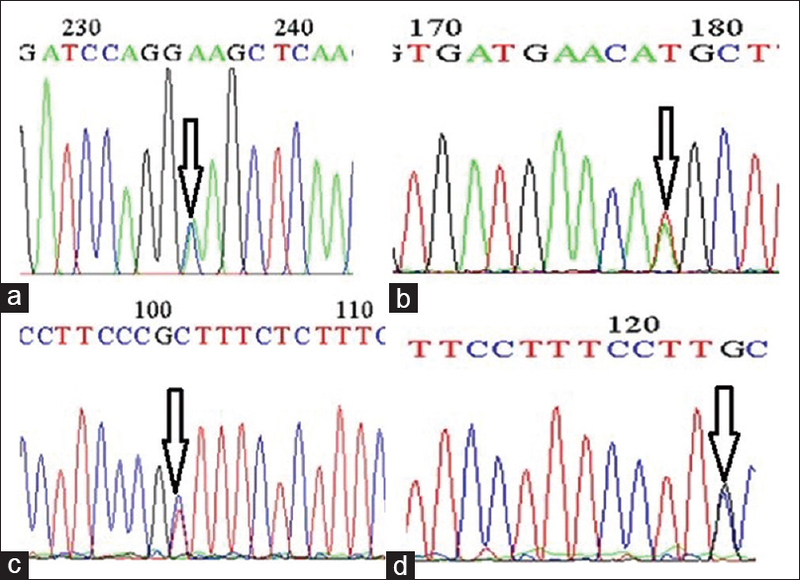 Polymerase chain reaction and Sanger sequencing were performed for GAA analysis. Results: GAA enzyme activity was significantly decreased in patients compared to the normal range (P = 0.02). Two individuals showed ten alterations in the GAA sequence, in which one of them (c. 1650del G) has not been previously described in the literature. A single Guanine deletion (del-G) was detected at codon 551 in exon 12. Conclusion: According to the literature, the detected change is a novel mutation. We hypothesized that the discovered deletion in the GAA might lead to a reduced activity of the gene product. Background: We aimed to explore the frequency of occult cancer in patients with deep-vein thrombosis (DVT) at a general hospital in Mexico City. Materials and Methods: From March 2012 to February 2015, all patients with primary DVT of lower extremities attended in the emergency department of our hospital were studied. Initially, all patients were evaluated with clinical history, physical examination, basic laboratories, abdominal ultrasound, chest X-ray, and duplex venous ultrasonography. In a case-by-case approach, if necessary, computed tomography, endoscopy, colonoscopy, and tumor markers were done. Results: From 182 patients with primary DVT, 30 (16.5%) presented occult cancer: Thirteen males and 17 females, with an average age of 61 years. In males, prostate cancer prevailed (6/13, 46%); meanwhile, in females, pelvic gynecologic cancers predominated (7/17, 41%). Conclusion: Our results suggest that in Mexican patients with primary DVT, occult cancer is frequent. Background: Obesity is a known prevalent major health issue. The aim of this study is to assay Iranian patients' problems with obesity and their expectations of bariatric surgery. Materials and Methods: In this study, we included patients who have used different medical noninvasive treatments and were unsuccessful in losing weight from the obesity clinic in Al Zahra Hospital, Isfahan, from 2014 to 2015. Morbidly obese patients were interviewed using some open-ended questions, and then, directional content analysis of data was done. Results: Analysis of data showed five main categories including (1) physical health, (2) psychological health, (3) social relationships, (4) environment, and (5) “about the causes of obesity” with some subcategories for each category. Conclusion: This study is the first step of designing a quality of life questionnaire while we focused on spiritual and cultural states of Iranian people. Background: Neuromyelitis optica spectrum disease (NMOSD) is a severe autoimmune demyelinating disorder of the central nervous system that throughout epidemiological data, it has not been completely determined. The aim of this study was to assess characteristics of NMOSD patients in Isfahan as one of the most prevalent cities for multiple sclerosis in Iran. Materials and Methods: Forty-five patients diagnosed as neuromyelitis optica (NMO) disease through 5 years enrolled in this study. Demographics and characteristics of disease such as Expanded Disability Status Scale (EDSS) score, disease duration, clinical symptoms, laboratory data, and magnetic resonance imaging findings (including T1, T2, and flair protocols) were recorded. NMO-immunoglobulin G serology assay was done in all of the patients by ELISA test. Results: Female to male ratio was 5.4:1. The mean age of disease onset was 29.8 ± 11.2 years. NMO antibody was positive in 24.4% of patients. The presenting symptoms were optic neuritis (55.5%), transverse myelitis (40%), and brainstem symptoms (4.5%). The interval between the first and second attack was 19.28 ± 31.27 months (range: 1 month to 17 years). The mean EDSS score of the patients was 2.8 ± 2.25. Frequency of long-extending cervical plaque was higher among men than women (85.7% vs. 57.9%). Conclusion: Based on this study, the mean age of NMOSD onset among Isfahan population was considerably lower than other studies, and there was higher frequency of long-extending cervical lesion among male patients which needs more consideration in further studies. Background: Considering a few studies on the genetic basis of the cystinuria in the Middle East and the population-specific distribution of mutations in the SLC3A1, we tried to find genetic variants in three exons (1, 3, and 8) of SLC3A1. Materials and Methods: In this study, exons 1, 3, and 8 of SLC3A1 gene of 25 unrelated cystinuria patients searched for genetic variations by polymerase chain reaction and sequencing. Results: There were five different variations in our studied population. We found one mutation in the SLC3A1 gene including missense variant M467K and identified three polymorphisms: nonsynonymous variant G38G, c. 610 + 169C>T and c. 610 + 147C>G within the SLC3A1 gene, and one new variant. Conclusion: Our results confirm that cystinuria is a heterogeneous disorder at the molecular level and more studies are needed to identify the distribution and frequency of mutations causing cystinuria in the Iranian population. Background: Astigmatism is the leading complication in visual recovery after penetrating keratoplasty (PKP) and deep anterior lamellar keratoplasty (DALK); in this study, we evaluated the outcome of femtosecond laser arcuate keratotomy (FLAK) after DALK and PKP in Iranian keratoconic patients. Materials and Methods: In this prospective interventional case series, refractive and keratometric predictability, efficacy, and complications of FLAK for postkeratoplasty astigmatism in keratoconus were evaluated; 23 eyes of 23 consecutive patients (mean age of 32.43 ± 9.11 years) with high astigmatism were enrolled. The femtosecond laser performed paired 90°-angled arcuate incisions. Results: Mean logarithm of the minimum angle of resolution of corrected and uncorrected visual acuity improved from preoperative values of 0.30 ± 0.18 and 0.85 ± 0.32 to 6-month values of 0.19 ± 0.17 and 0.65 ± 0.33, respectively (P < 0.05). Mean subjective astigmatism was 7.79 ± 2.64 diopter (D) preoperatively and 3.69 ± 2.25D at 6-month after surgery (P < 0.05). Surgically induced astigmatism was 9.27 ± 5.00D. Mean refractive spherical equivalent showed no significant (P = 0.69) hyperopic shift from − 4.21 ± 4.84D preoperatively to − 2.16 ± 6.09D postoperatively. Two (8.7%) microperforations were observed. Conclusion: FLAK is a relatively safe and effective method for the treatment of postkeratoplasty astigmatism. Background: This study was designed to determine the prevalence of concomitant anatomic variation of paranasal sinuses in patients with antrochoanal polyp (ACP). Materials and Methods: Among patients referred by their clinicians for standard computed tomography scan of paranasal sinuses septal deviation, concha bullosa, and retention cyst were evaluated in both patients with ACP as well as in a control group. Results: Of the 17 patients with ACP, fifteen patients (88.2%) had septal deviation and two patients (11.8%) had concha bullosa. None of the patients with ACP had retention cyst or hypertrophic turbinate. Of the 78 patients in control group, twenty-nine (37.2%) had septal deviation, six (7.7%) had concha bullosa, seven (8.9%) had retention cyst, and one (1.2%) had hypertrophic turbinate. Septal deviation in patients with ACP has higher incidence (P < 0.001). Conclusion: This study showed that septal deviation is an anatomic variation which is significantly concomitant with ACP. Larger studies are needed to show the role of other anatomic variations in patients with ACP. Background: This study aimed to explore the cellular morphology of respiratory epithelium in Mycoplasma pneumonia (MpP) patients. 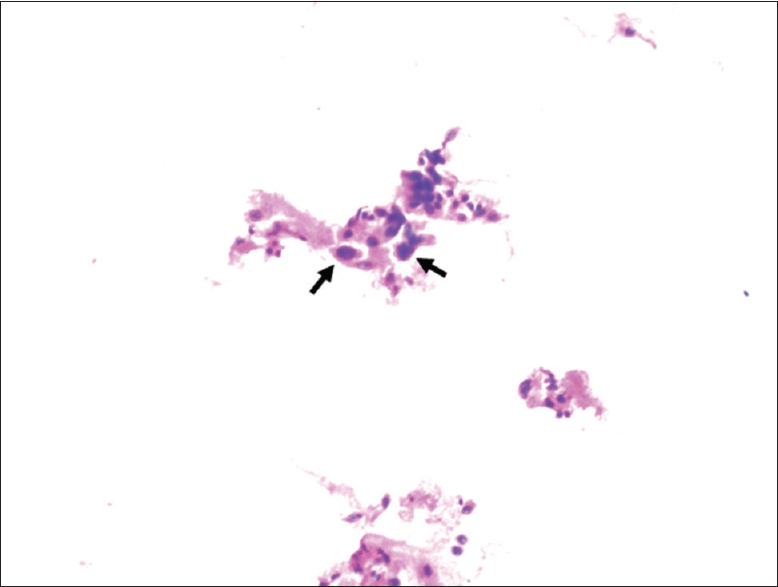 Materials and Methods: The cast-off cell morphological findings from bronchoscopic brushings in MpP and community-acquired pneumonia (CAP) caused by typical pathogens were reviewed. Results: Compared with the CAP group, cellular dysplasia in respiratory tract epithelial brushings was significantly greater in MpP patients (P = 0.033). Conclusion: Unique biological characteristics and mechanisms of pathogenesis of Mycoplasma pneumoniae (Mp) may result in dyskaryotic changes in respiratory epithelium in adult MpP. Background: We studied the role of maternal folic acid supplementation in modifying the effects of methylenetetrahydrofolate reductase (MTHFR C677T and A1298C) gene polymorphisms in Iranian children with oral clefts. Materials and Methods: Forty-seven newborn infants with orofacial cleft and their mothers were selected randomly. Mothers were matched regarding dietary folate intake. The genotyping on venous blood was carried out. Consistency between maternal and child genotypes was analyzed. Results: Genotype consistency was not statistically significant in both C677T and A1298C gene variants (P > 0.05). Conclusion: Maternal folic acid consumption may not have any significant effect on modifying C677T and A1298C polymorphisms in children. Short Communication: Where does magnetic resonance imaging stand in the diagnosis of knee injuries? Background: The aim of this study was to determine the diagnostic value of magnetic resonance imaging (MRI) in the diagnosis of knee injuries. Materials and Methods: Ninety-eight consecutive patients were enrolled in the study. In all patients, MRI and arthroscopy were performed and the results were compared. Results: MRI was most sensitive in the detection of medial meniscus injuries, and the highest specificity and negative predictive value (NPV) were found in the detection of posterior cruciate ligament injuries. Conclusion: MRI is a valuable tool, and according to its high NPV, normal MRI can prevent unnecessary arthroscopic interventions. Background: Over the last 10 years, the evidential practice has been developing in Kazakhstan. The clinical protocols of diagnostics and treatment were implemented in the country since 2007. We analyzed the normal birth practice in Kazakhstan. Materials and Methods: Obstetricians and midwives were subject to the questionnaire survey in four large Maternity Hospitals of Almaty. Results: Totally, 72 midwives and 50 obstetricians took part in the questionnaire survey. 4% of physicians indicated the regular use of enema, 11.1% of midwives and 24% of physicians — the shaving of the pubis, and the regular use of amniotomy was noted by 12% of physicians and 41.7% of midwives. At the second stage, the application of the Kristeller's method was noted by 8% of physicians and 11.1% of midwives. Conclusion: The noncompliance of the normal birth surveillance in Kazakhstan with the WHO's recommendations appears in the usage of routine methods at the first stage and of the Kristeller's method at the second stage of normal birth.